It's a long way from KL to Lahore. As we suffer through dripping skies and thick, wet heat, the capital city of Pakistan's fertile Punjab plains is awash in sunlight and shivering through temperatures that dip to freezing. While we gear up for the commercialized shopping frenzy that is Christmas, Lahoris ready themselves for Moharram, the first month of the Muslim calendar and the most sacred after Ramadan. As we thrill to the opening of not one, but two new shopping malls, the architectural heritage sites that dot Pakistan's storied second city give a nod to its ancient past. KL may be apples to Lahore's oranges, but the two do have some things in common: keema, haleem, and zarda, to name a few. And thanks to a shy Lahori named Osman, ours may just be as tasty as theirs. 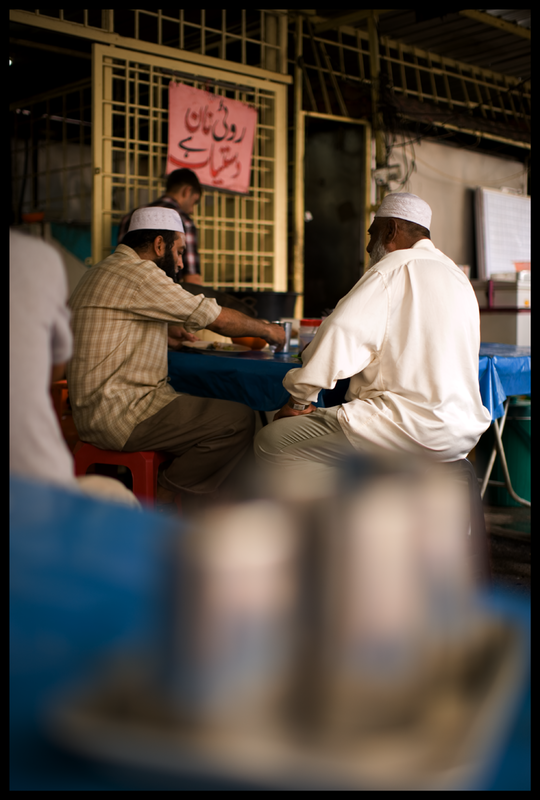 On a small lane that branches off Jalan Masjid Jamek sit a scrum of stalls offering naan and a few Pakistani dishes. The fare is not bad - hearty, somewhat flavorful - but all in all unremarkable. But the food that Osman serves from a nothing-much 'shop' at the end of a row of Malay stalls on nearby Lorong Bunus Dua is something else altogether. Maybe it's because he hails from Lahore, a city whose residents are known for their love of eating. Maybe it's because this sturdy man obviously enjoys food himself. Or perhaps he's simply gifted in the kitchen arts (cooking being the trade he practiced before leaving Lahore not two years ago). He certainly likes to feed people. Tell him you're loving one of his creations and an ear-to-ear grin splits his usually solemn bearded mien in half. Osman derives much pleasure from the sight of a patron's cleaned plate. Pakistani cuisine shows the influence of the foods of centuries of invaders (Alexander the Great and the Mughuls among them) and the many Indian Muslims who immigrated to the country in 1947 during the Partition from India. It's Punjabi with hints of Central Asia (the origin of the rounded vertical oven known as the tandoor), Persia, and the Middle East, sometimes challengingly spicy but also delicately aromatic. The country's regions connote culinary differences. 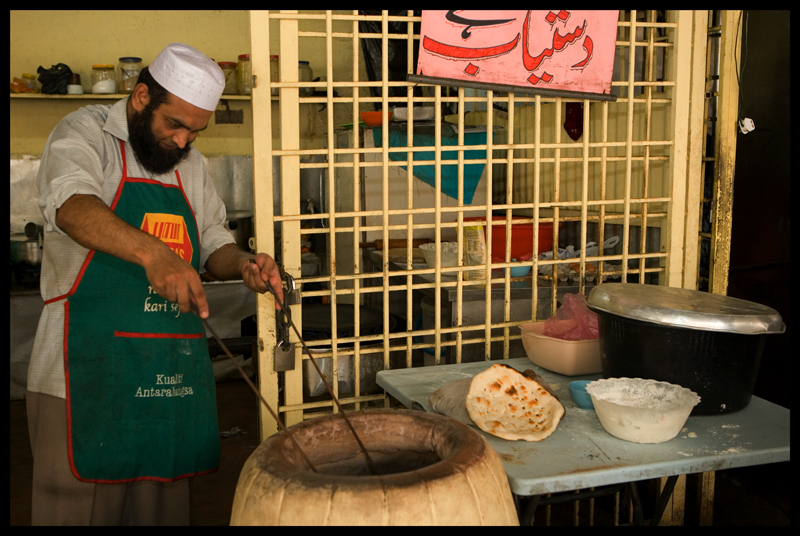 Lahore is considered to have the best food of all. 'Turn right at the Mydin - not the one selling clothes. If you get lost, telephone, and someone will come to fetch you! The result was a lunch, taken by the tandoor, of flat breads (pillowy naan and ghee-laden paratha), keema (a dry minced-meat 'curry' dotted with peas), crispy okra flavored with onions, and tomato-ey channa dal. Because it was Sunday nihari, a cardamom-fragrant but tongue-numbingly spicy stew of tender beef in an impossibly smooth sauce garnished with shards of fresh ginger, also graced the table. All were accompanied by slices of raw onion, a condiment characteristic of the Pakistani table. Customers drifted in post-prayers at the nearby mosque, greeting each other in Urdu and English and filling the limited number of sears. The naan was so delicious that a takeaway order of ten somehow found its way into the hands of these visitors too stuffed to finish their nihari. Daily specials are a sure sign of a cook who refused to be slap-dash with the preparation of traditionally complicated, long-cooked dishes. On Friday and Sunday it's chicken biryani. On Monday, mutton kofta. On Wednesdays diners are treated to a dish often taken during Moharram: haleem, a comfortingly warm-spiced porridge of wheat, lentils, and meat. Osman, a friendly man but one, nonetheless, of reserve, is less than forthcoming when asked how and where he learned to cook. There the English - he doesn't speak much of it (and we speak even less Urdu) - but there's also his air of embarrassed humility. But ask if he has any sweets stashed away in the kitchen, and virtual verbosity ensues. 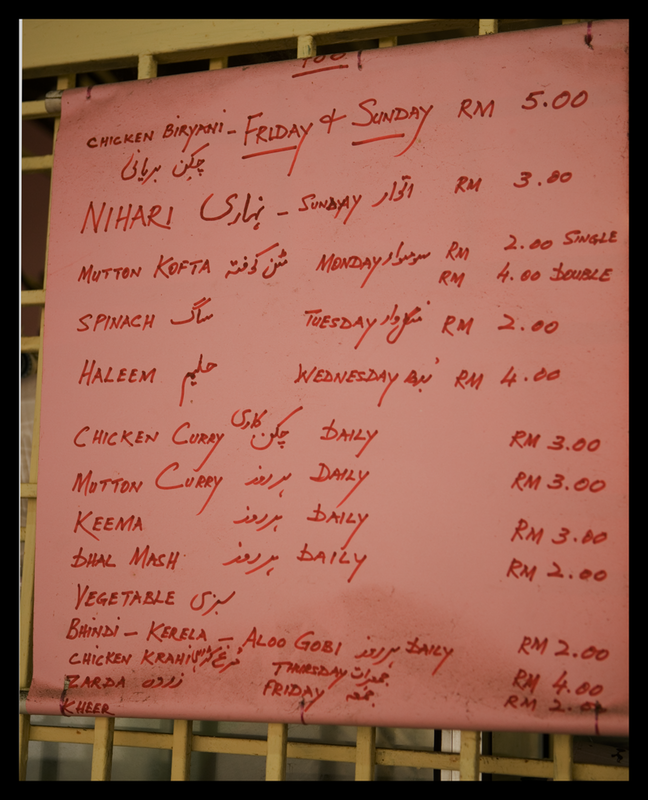 Osman's small shop is near the end of Lorong Bunus Dua, just off Jalan Masjid Jamek. As he says, take a right at the Mydin - and look for the tandoor. there's a pakistani man selling tandoori and such in Melaka. it is called pak putra, and very famous with the locals. It is somewhere behind the jonker street area. The tadoori oven looks great. I like naan dip in curry sauce. I see Aloo Gobi (potatoes and cauliflower) curry in the menu. The prices are cheap compared to Florida. 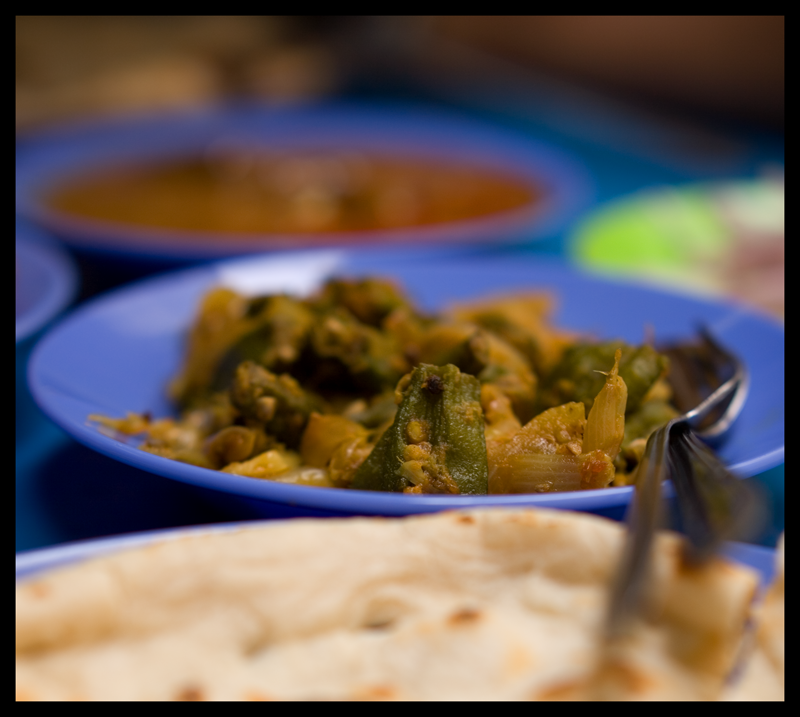 An average Indian dish cost 8-12 USD and portions are small. Chinese is more affordable. My mom used to work for Tenaga in Masjid India area. I would hang around there sometimes. There were many Indian Muslims restaurants. I miss roti chanai. Hey y'all! I've read your KL blog for awhile now, but haven't posted because I was too busy stuffing my face. I've lived here in the city for ~5 months (working for a local media NGO) and *kind* of think it's got the best food in the world. Which is saying a lot, from a good ol' Southern boy from Memphis, TN. But re: this one in particular: what's a good way to get here via mass transit? I've got to LRT basically everywhere and sort of orient myself around that axis regardless of where I am. Feel free to send me an email, and thanks so much, both of you!